I am applying for Google Summer of Code 2013 with this “Biodiversity Visualizations using R” proposal. I am posting this idea to get feedback and suggestions from Biodiversity Informatics community. R is increasingly being used in Biodiversity information analysis. There are several R packages like rgbif and rvertnet in rOpenSci suite to query, download and to some extent analyse the data within R workflow. We also have packages like dismo and SDMTools for modelling the data. It will be useful to have a package to quickly visualize biodiversity data. These visualizations would be helpful to understand extent of geographical, taxonomic and temporal coverage, gaps and biases in data. The proposal is to work on a R package to provide functionality to quickly generate the visualizations of the data set user has gathered or generated. Data preparation – The data needs to be converted into suitable format for visualizations and analysis i.e. date format, taxonomic classification and geographical co-ordinates should be in uniform and usable formats. Data summary: Function(s) to quickly summarize the data set telling user number of records, number of records with Lat Long values, Bounding box of Lat Long Values, Date range and so on. Geographic coverage – functions to visualize the data points on maps, density maps at different scales like Country level, Degree grid and so on. Density of the records worldwide. Darker color indicates higher density of records. 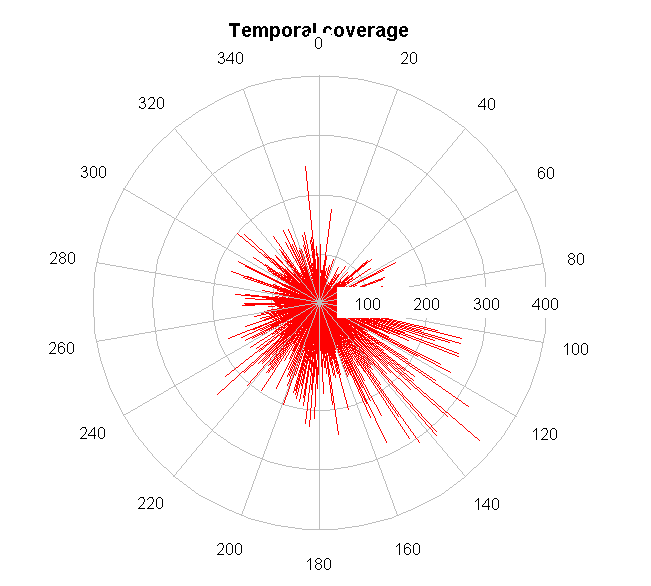 Temporal coverage of the records. Each line represents number of records on that particular day. 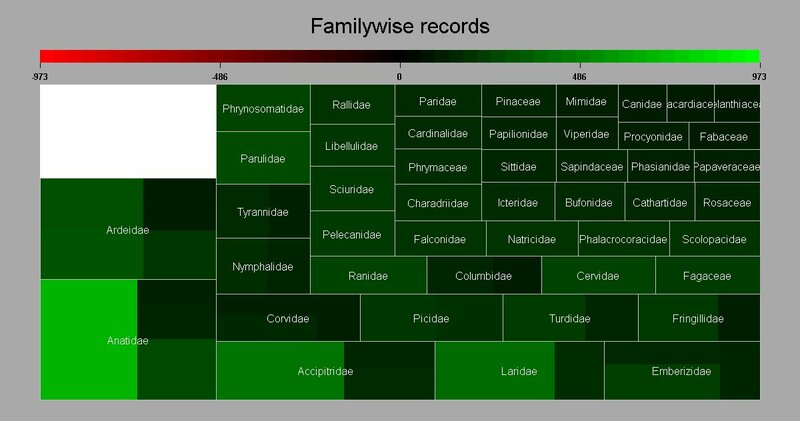 Taxonomic coverage – functions to visualize the taxonomic coverage of data in Tree Map formats by Number of records per species and number of species covered.